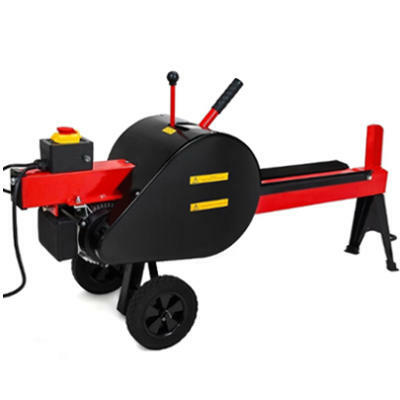 How to Select the Best Kinetic Log Splitter? While it’s easy to assume that log splitting equipment with hydraulic components are the best products for the job, a kinetic log splitter holds itself well on the market as well. Even though they aren’t the most well known product, nor the most cost effective, they are just as effective – and in some cases more so – than other log splitters. In fact, the majority of kinetic log splitters can split one log in just three seconds. Some also offer the same power as a 34 ton hydraulic log splitter – all from a flywheel feeding energy to the gas or electric engine. Our buying guide offers four top rated kinetic log splitters on the market – all with varying features and price tags. While it’s tough to make the call on the best kinetic log splitter for the money, our pros and cons listed for each product are sure to help make that decision far easier when you buy online. The beauty of a kinetic log splitter is its ability to fit nicely into any environment. It’s suitable for professionals, for commercial or industrial use, and even those within residential sections. Provided you know how to operate log splitting equipment safely, it will complete splitting tasks with ease. As with any power tool, you must check its features in comparison to the work you’re undertaking. Some may not be suitable for larger tasks, or vice versa. The power produced by kinetic wood splitting equipment is phenomenal. But with great power comes a great need for adequate safety measures. Due to the speed at which this machine splits wood, and its energy from the flywheel, operators should use one with caution. Most kinetic log splitters will come with a manufacturer’s guide. Within this guide, you will generally find a list of safety suggestions in order to put the operator in the best position possible. It may include particular safety features the machine has, as well as recommendations for safety equipment such as eye and ear protection, a hard hat and safety boots. You could buy the most reliable and well known brand, but without using it within its means, you will still run into efficiency problems. Many people believe choosing a popular brand guarantees you a reliable product. While the product itself is reliable when used correctly, it could run very poorly when faced with a challenge it can’t win. That is why it’s important to never push it beyond its limits. Any wood splitting equipment is only as good as its operator. Unlike many other kinds of wood splitting equipment, a kinetic log splitter has features to give it a higher level of efficiency. Instead of hydraulic components to drive the splitting wedge, a flywheel works in conjunction with a gas engine or an electric motor. The power of the flywheel feeds the engine which, in turn, produces maximum power delivered to the splitting wedge. It requires no hydraulic fluids or oils. While you don’t have to maintain any hydraulic components on a kinetic powered log splitter, you do have to maintain the flywheel. This means the maintenance requirements can be considered fairly complex. Unless, of course, you know what you’re doing. Operators should first ensure the gas engine, if applicable, has all the fluids and oils it needs for operating at an efficient level. The entire machine also needs to be clean, free of debris and with no obstructions in the flywheel. It also pays to check that all moving parts are well lubricated and that no nuts or bolts are loose. The price of a top rated kinetic log splitter varies depending on the make, model, brand or manufacturer. Electric kinetic log splitters can be far cheaper than gas powered models, and the overall kinetic type can be considered cheaper than hydraulic powered gas splitters. When you’re deciding on the best kinetic log splitter for the money, don’t just look at your budget and the price tag. Weigh up the features as well. While spending less is a bonus, it might not buy the exact splitter you’re after. It’s very affordable for a range of buyers. It doesn’t require much maintenance as it’s electric. It can out-split a 10 ton hydraulic splitter. It has powerful flywheels to deliver better splitting force. The ram doesn’t always automatically retract. It’s not a suitable option for knotty wood or cords. QHow does it compare to an electric hydraulic log splitter? AIt can cut 15 times faster. It’s hard to believe something so affordable could be so powerful. But that’s exactly what you get with this Generac 10 ton log splitter. With a one second cycle time and the ability to split wood up to 15 times faster than its hydraulic counterpart, it’s worth its weight in gold. The beauty of this splitter is how easy it is to use, as well. Simply plug it into a wall socket, turn it on and get splitting! It’s easily one of the best kinetic log splitters for the money. Check out what other people who purchased this product think about it. 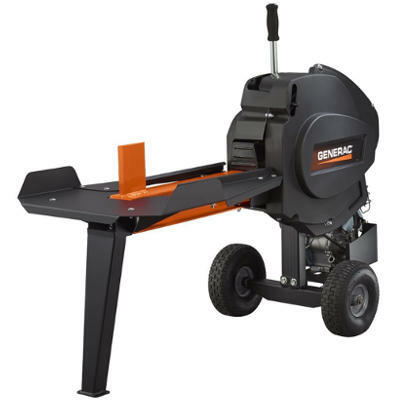 Read Generac K10 kinetic log splitter reviews. It performs better than a 12 ton hydraulic log splitter. It doesn’t create fumes or very much noise. It’s small and can fit in the trunk of a car. It costs very little to own and run. The motor, in comparison to its log splitting capabilities, isn’t very powerful. It’s not a consistent splitter. Dimensions: 25 x 12 x 49 inches. Engine Capacity: 2HP, 4900 RPM. AIt has settings for logs at 24, 21.6 and 19 inches in size. While its engine size makes it only suitable for residential use, this Powerhouse log splitter is still exceptional value for money. It’s for sale at an affordable price, it can split logs up to 24 inches in size, and it’s even portable. It may run on an electric motor, but that doesn’t mean it doesn’t have enough power to run with the big players. This machine is easily comparable to a 12 ton hydraulic log splitter. Check out what other people who purchased this product think about it. 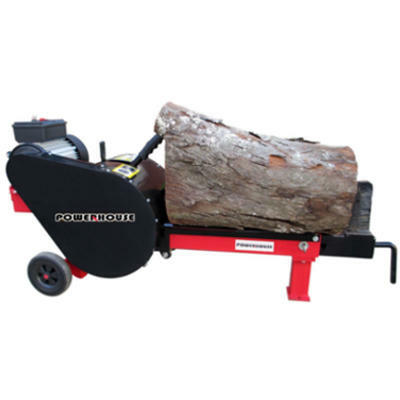 Read Powerhouse XM680 kinetic log splitter reviews. It out-splits conventional 20-25 ton machines. It runs on a standard 15 amp circuit. It takes minimal time to assemble. It’s a bit more expensive than some other kinetic log splitters on the market. It splits smaller logs than several other kinetic log splitters on the market. QHow many volts does it have? While it’s a convenient option for homeowners, this MTN Gearsmith does fall short in comparison to other options for sale. While it’s reliable, durable and powerful, its log splitting capacity is not as generous as others. For this shortfall, its price tag also doesn’t accurately reflect its features and overall benefits. It’s not the best option, but it’s certainly not the worst. It does provide residential users with a solid option for backyard splitting requirements. Check out what other people who purchased this product think about it. Read MTN Gearsmith kinetic log splitter reviews. It works six times faster than its hydraulic powered counterpart. It shuts down when the oil is low. It out-splits a 22 ton splitter. For being a commercial grade machine, it’s exceptionally affordable. Dimensions: 46 x 25 x 62 inches. Whether you’re a residential home owner or a business owner, you’re sure to see the benefits of this Generac kinetic log splitter. Featuring 22 tons of pure pushing power, it’s a cost effective option for quick, efficient and quality log splitting. It also features a 99cc engine to be on-par, and in some cases even better, than hydraulic powered log splitters with similar specs. Check out what other people who purchased this product think about it. 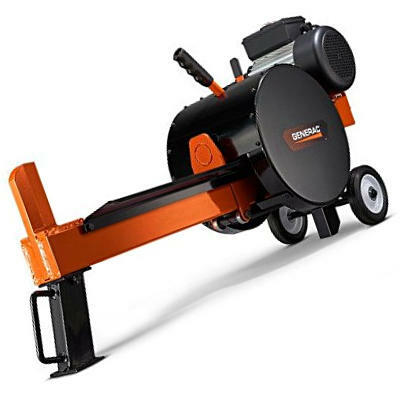 Read Generac kinetic log splitter reviews. Where to Buy Kinetic Log Splitters? While traditional shopping methods work well, choosing to buy online can often be a better option. Websites such as Amazon gives customers the opportunity to review several products of varying brands to ensure they get the best deal. Therefore, it’s becoming a preferred method worldwide.